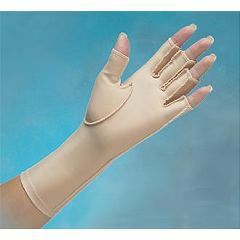 Edema Control Gloves are made of nylon Lycra® with seams on the outside for smooth edema control. Latex free. Gloves provide 15 to 25 mm Hg of soft, gentle compression to edematous tissue. Tipless Finger Over the Wrist Length provides tactile sensibility awareness. Measures 3" (7.6cm) proximal to wrist crease. Over the Wrist Length is also available in full finger style. To size, see chart below. Sold individually. Arthritic. good for swollen hands. I have severe nerve damage, and this glove is soothing and helps with the pain I endue daily. glove was prescribed by physical therapist for swelling in my left wrist/hand after a break. comfortable but seam came unsewn &amp; stains. Outstanding product for low price! Quality Materials. Breathable. Comfortable. Durable. good for swollen hands. help with surgery swellig. I continue to use this product even months after surgery, if I've overdone using my hand. I also use it with my Comfort Cool CMC brace, if I go out &amp; want double protection for my hand. Daily Use. great under my hand brace. soft material with comfortable seams. Comfortable. Breathable. Right amount of compressi. Outside seams ensure comf. Outside seams ensure comf. Wears Out Quickly. Fabric on palm gets worn . Washes and dries quickly. Gives needed relief, however, shows wear on palm very quickly and looks shabby.